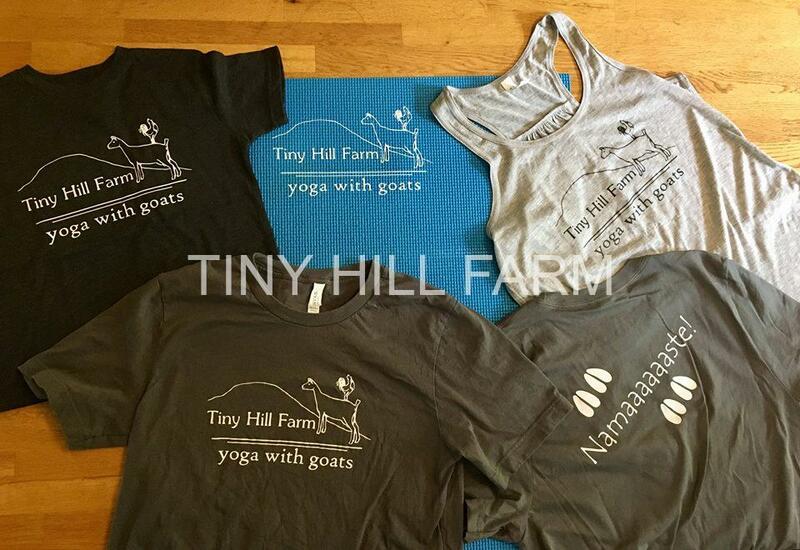 Tiny Hill Farm yoga with goats merch! 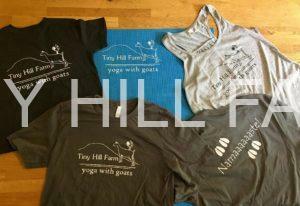 Want an awesome Tiny Hill Farm Yoga with Goats shirt or a yoga mat, but can’t make it to a class? We have double-sided t-shirts, tank tops, youth t-shirts, and yoga mats available for sale and ready to ship. $20 each. Priority shipping is a flat $4 anywhere in the US. We can also do free pickup on the farm! Email us at tiny hill farm (at) gmail (dot) com. Or call/text (603)817-0081. We’ll have yoga pants and more shirts available soon! We’ll also be doing a “kids with kids” child’s class in August. Contact us with any questions or if you would like to sign up. No yoga experience is necessary, but a love of adorable goats is mandatory! Classes last one hour and are $20 per person. Please contact us by calling/texting (603)817-0081, use the “contact us” button, or email tiny hill farm (at) gmail.com to register or with any questions. Namaste!